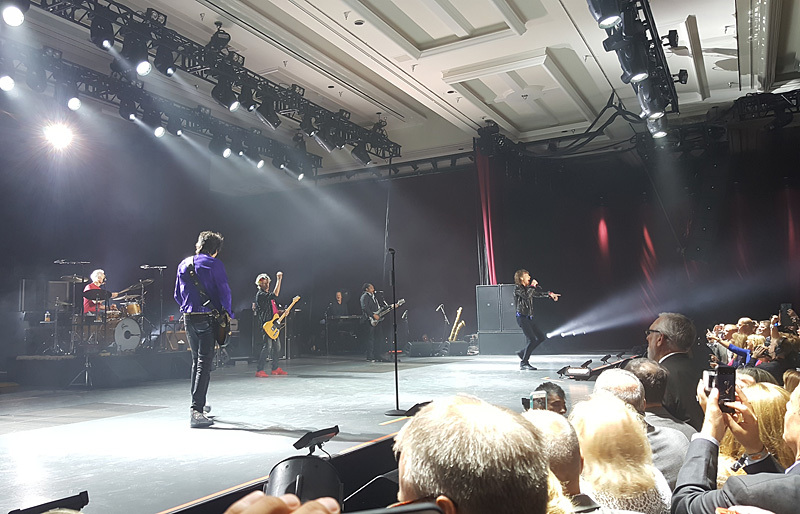 On Monday October 3, 2016 The Rolling Stones performed a corporate private show at the Bellagio Hotel in Las Vegas. With the upcoming Desert Trip and Vegas T-mobile Arena shows coming up and band rehearsals in full swing in LA the anticipation was high amongst fans if and where there would be a warmup show by the band. This show was maybe the best kept secret in decades. I booked a room at the Bellagio three months earlier after sniffing an online rumor of which I never heard again until I wanted to cancel my booking thinking that either plans had changed or the rumor was simply false as many of them are. However, then the rumors about a warmup gig started to appear. A sponsored event was mentioned possibly in Las Vegas and this was my green light to take a gamble and book my flights and have a go at this. When I checked in my hotel it didn’t take long before I saw some familiar faces who stayed at the same hotel and I knew I betted on the right horse. The show was organized by Freightliner which is a division of Daimler Trucks North America which has a history in putting high profile shows together for their yearly meeting and customer-appreciation dinner. Last year, Paul McCartney performed at the same event in Philadelphia. After the show I learned that there were 1120 guests that had a black-tie dinner before the show, and together with some guests that didn’t make it to dinner, the whole party at the show couldn’t be more than 1400. Fun fact was that the guests had no idea which band would play for them that night. The moment the doors to the ballroom opened a great buzz went through the hallway of the Bellagio. It must have pleased the organization to see that their efforts had paid off in a huge surprise. Inside there were two raised platforms, dressed up with LED tongue logos, on the sides of the ballroom with tables and chairs. In front of the catwalk there were several rows of seats while the rest was standing room all the way to the barrier. The stage itself was very low, like table high. There were three screens, a large center screen on which they were showing music video snippets and two smaller ones to the side with a fur tongue design. There was plenty of room in the ballroom for the number of guests. Through a small hole of a curtain we could see some band members getting ready to go on stage and it didn’t take long before the band is announced and enter the stage to start the first riffs of Start Me Up. Clearly the band is happy to be on stage again. Immediately it becomes clear that this is another audience than usual. Of course there is cheering, but the people are hardly moving. Probably most people having a drink in their hands doesn’t help if you want to wave or clap. You Got Me Rocking is the 2nd song followed by It’s Only Rock and Roll. You can clearly see the band working hard to get the crowd going. Mick went the extra mile as he always does when there is a tough audience. However, the audience experienced it completely differently. I talked to quite some people after the show, and ALL had a blast and said to have enjoyed the show massively. Out of control was absolutely amazing. Keith and Mick challenging each other during the harmonica parts and there were a lot of laughs and inside jokes I’m sure. Interestingly, Keith started to get slightly annoyed that the efforts of the band didn’t have the wished effect and he took matters in his own hands. He started sweeping up the audience making moves and saying things like ‘COME ON’, he also started to mime him taking off a tie, while saying ’Take off your ties, take off your ties’.. It was new for me to see Keith doing a job that Mick is so good at. It was all hands on deck. We all know what happens if Keith has an issue, he goes at it! That resulted in extra powerful riffs and masterful finger work. He let the guitar do the talking and blow the crowd away. The set continued with Tumbling Dice and Wild horses. 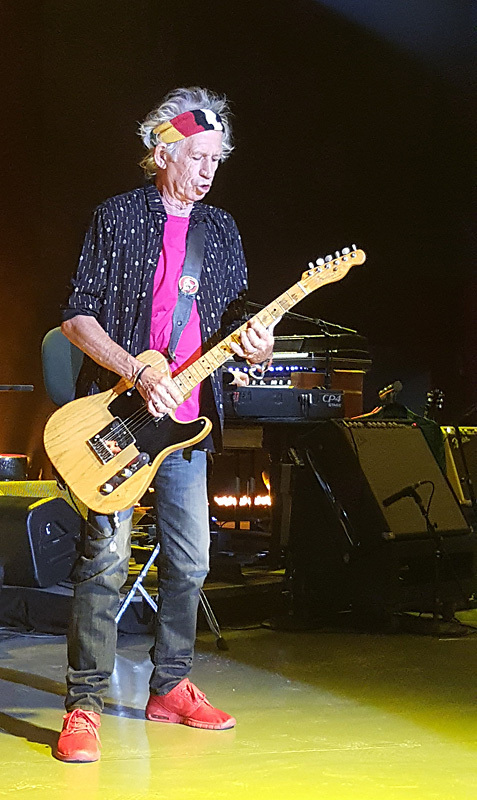 Keith is awesome on backing vocals during Wild Horses, but I heard Mick having some voice issues. He started to ease off the end of lines, like he’s usually doing during rehearsals while not wanting to stress his voice. I’m pretty sure this is a detail that the guests did not notice at all. Next up is the big surprise of the night. They played Mixed Emotions. Now, I have not seen the Stones play live during the Steel Wheels/Urban jungle tour, so I have never heard this song played live before. I couldn’t believe it at first. I looked and fanatically pointed at Bernard Fowler as this is the song in the 25x5 documentary (I believe) which he sings while he’s auditioning with the Stones. We exchange laughs, not sure if he understood what I was aiming at, but still it was a fun moment. As the band is warming up for the upcoming shows, the timing punctuations weren’t quite on and delivered as the song goes, but it was an amazing experience. After taking that in to the fullest, Honky Tonk Woman. 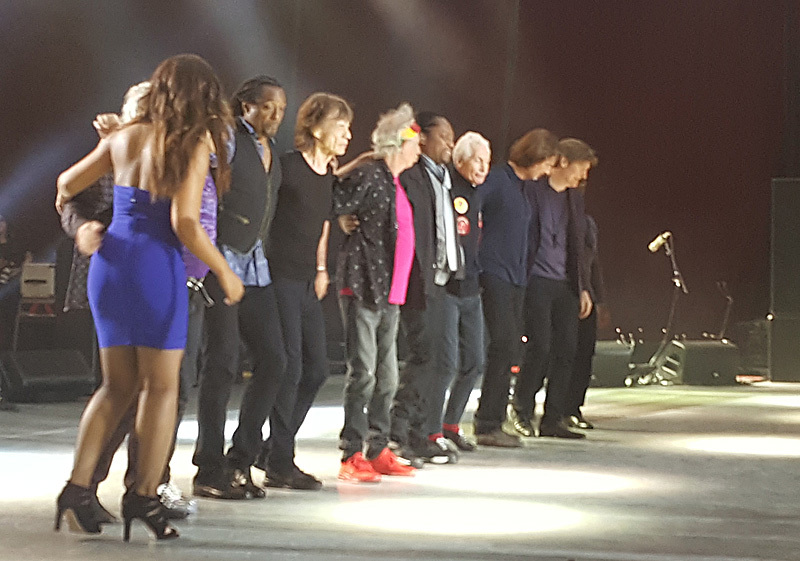 The band clearly liked our energy on Ronnie’s side where a few genuine fans seemed to be clustered and we got rewarded by a lot of close-up time of Mick, Keith and Ronnie right in front of us. It was time for the introductions followed by Miss You. Mick asked the crowd if they wanted to sing with them and it was amazing. It became clear that the crowd was not going to dance and jump with their black tie outfits, but they could SING and the applause was huge. It was a turning point of the show. Next was Sacha Allen’s turn to show off her skills during Gimme Shelter. People were also very vocal during Brown Sugar’s ‘yeah yeah yeah WHOOO’s. The band did it, they got the participation they were working on so hard. Mick had also some jokes ready calling out some types of Freightliner trucks and how great it is to take them out driving.. and that he’s waiting on the driverless one. I could not resist starting the ‘Whoo hoo’s of Sympathy for the Devil when Charlie set in the drum beat and that was eagerly followed by the whole ballroom. Alright, full speed ahead to Jumping Jack Flash. The roar of applause and shouting after the song did make you believe you were in a much larger room. The band retreated and the crowd continued while also hard stomping on the wooden floor showing they were not done yet. They got rewarded with Satisfaction as the grande finale. After a quick bow they were gone leaving the guests happy and they slowly started to realize what had hit them like a Freightliner.